Around Here We Don't Do "Cookie Cutter"
Whoever said all hotel rooms should be the same had no idea what they were missing! Feast your eyes on our 196 uniquely designed rooms created to make your beach getaway even more epic by adding the perfect backdrop to your vacation. 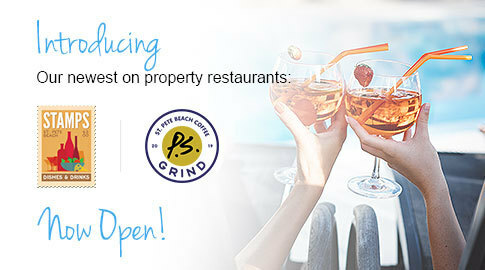 Redeemable at: Stamps, PS Grind, or PCI Beach Bar & Snack Shack. 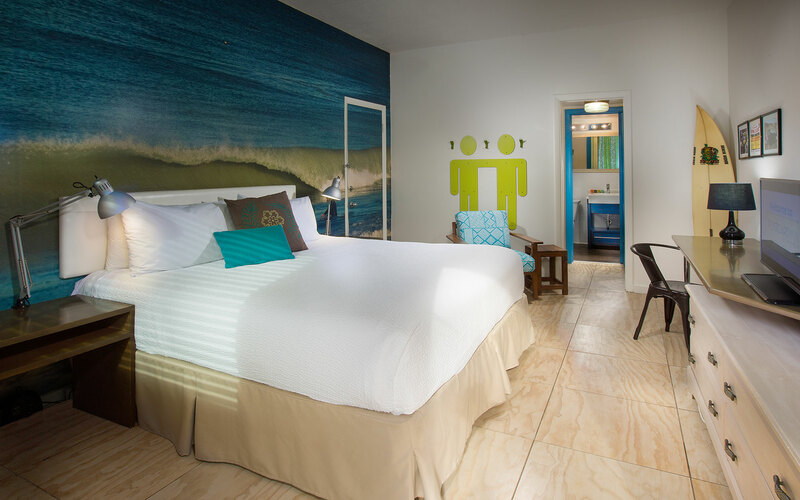 Located on the quiet perimeter of The Postcard Inn, each of these hotel rooms is outfitted with a king-sized bed, a newly remodeled bathroom, and each is decorated with large-scale surf photography by local St. Pete artists. 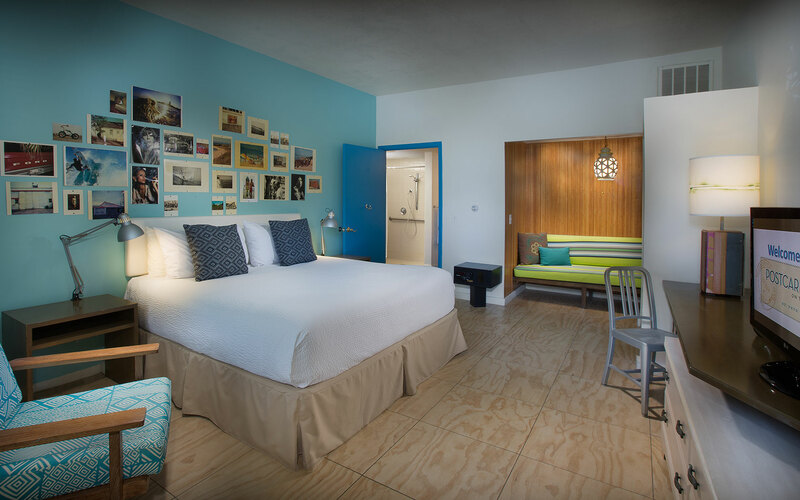 Located on the quiet perimeter of PCI, each of these Postcard Inn hotel rooms is outfitted with two queens-sized beds, a newly remodeled bathroom, sitting area and each is decorated with large-scale surf photography by local St. Pete artists. 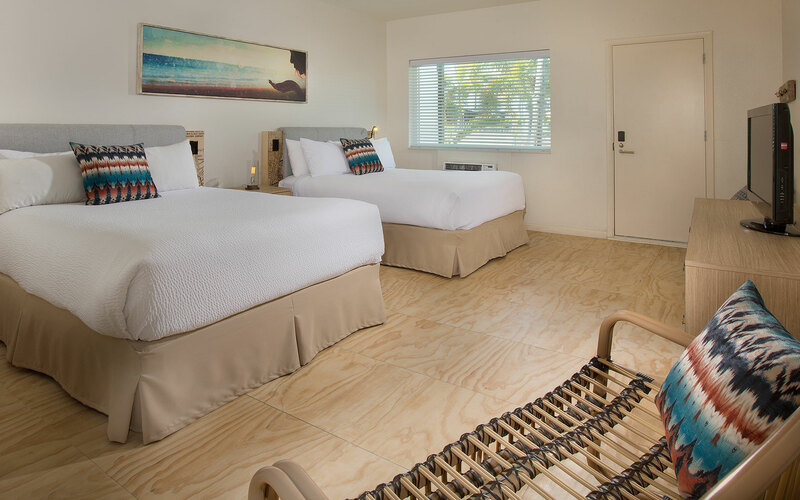 Located on the garden side of the Postcard Inn, each of these rooms is outfitted with two queen beds, a newly remodeled bathroom, and a stylish sitting area as well as surfing memorabilia and incredible surf photography by local St. Pete artists. 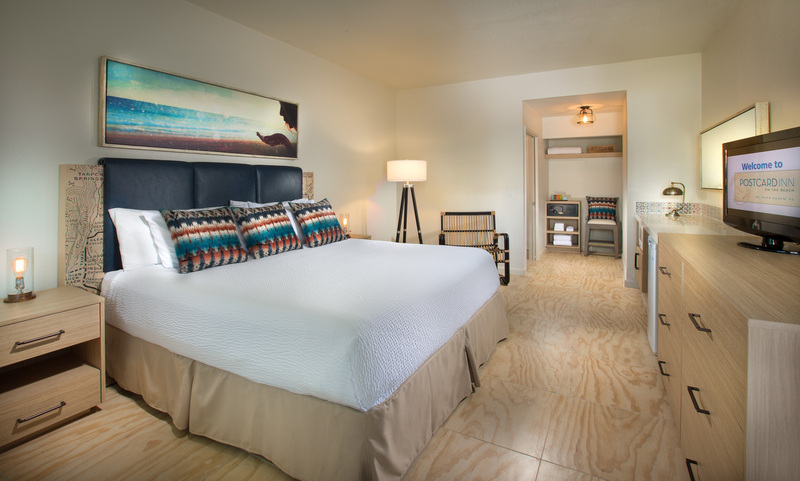 Located on the main level of the Postcard Inn and right next to our pool, each of these rooms comes packed with a super chill patio next to the pool area, a king-sized, and a newly renovated bathroom. These cozy cabanas also feature large-scale surf photography by local St. Pete artists as well as wooden carved headboards with beautiful detailed maps of the area. 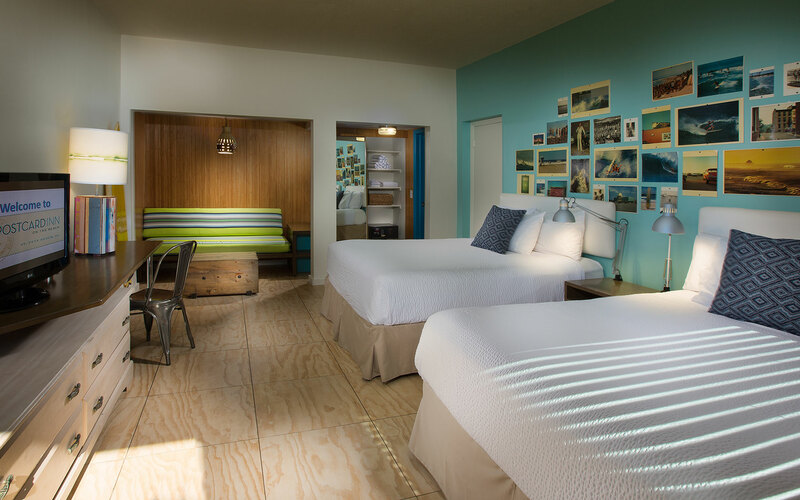 Located on the main level of the Postcard Inn and right next to our pool, each of these rooms comes packed with a super chill patio connected to the pool area, two queen-sized beds, and a newly renovated bathroom. 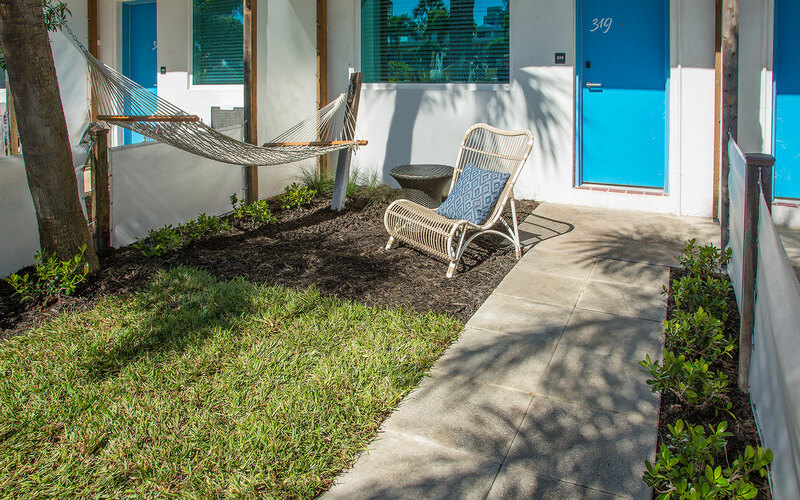 These cozy cabanas also feature large-scale surf photography by local St. Pete artists as well as wooden carved headboards with beautiful detailed maps of the area. Located on the quiet perimeter the Postcard Inn, each of these ADA-compliant rooms is outfitted with a king-sized bed. This room is specially configured for the accessibility and comfort of up to 2 adults. This room is located on the first floor and is wheelchair accessible and service-animal friendly. The accessible private bathroom has an accessible shower with handrails, hairdryer, plush towels, and complimentary toiletries.